Is it a yes or a no? Decision pending… all eyes over there… and it’s a yes! That’s what happened during the second ODI match between England and India at the Lord’s cricket stadium in London over the weekend. 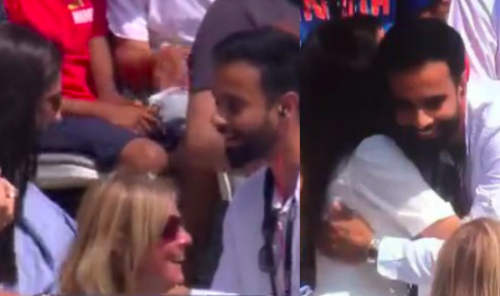 A man, Charan Gill, proposed to his girlfriend, Pavan Bains, during the first innings of the match. With cameras and all the attention on them, the latter said ‘yes’, much to the happiness of the crowd, and her beau, of course. Even, Indian leg-spinner Yuzvendra Chahal was amused, as he clapped for a bit before going on to bowl again. England went on to win that match by 86 runs, thanks to Joe Root’s 113 and Liam Plunkett’s four-wicket haul. The three-game series is now locked up at 1-1. A similar incident had happened at the 2016 Rio Olympics. During the medal ceremony of women’s three-metre springboard event, silver medallist He Zi of China saw her boyfriend of six years Qin Kai come over. He, then, popped the question to her live on air. No prizes for guessing how she reacted to it.